Which horses are concerned by prohibited substances and anti-doping rules? Morally and ethically, any horse competing regardless of the equine sport and regardless of the level whether it be a “local riding club” event or a prestigious, high profile “international event” should be concerned. Testing for the presence of prohibited substances is reserved predominantly for racehorses (governed by local Jockey Club regulations), FEI competitions and other affiliated competitions according to the country. Vetoquinol advises that the horse rider at the time of registration for a race or competition ensures that he/she is aware of any rules and regulations that might concern the forthcoming event. What samples are routinely taken? As with athletes, urine samples are the most commonly obtained samples that are submitted to authorised laboratories for analysis, but in the absence of a “willing” urine sample, the veterinary surgeon may be obliged to take a blood sample. In certain cases, both are taken! Most medicines and drugs are prohibited if detected in a horse at the time of competition. This ruling is based on the philosophy that a horse should compete on its own merits without any unfair advantage. It is also to prevent horses damaging their athletic potential by drugs masking unfitness, lameness or disease. The Equine Prohibited List includes three classes of Prohibited Substances: Doping, Medication Class A and Medication Class B.
Doping’ implies a serious attempt may have been made to influence a horse’s performance. Medication Classes A and B’ indicate the finding of a prohibited substance that can be used in the bona fide veterinary treatment of a horse. Examples of ‘Doping’ and ‘Medication’ classes of Prohibited Substances are provided in the Equine Prohibited List that can be found on the FEI website (www.fei.org). Capasaicin, derived from chili peppers, made the headlines during the 2008 Equestrian Olympic game for all the wrong reasons. This highlights the need for riders who compete in affiliated competitions to check up on the ingredients of all feed stuffs including supplements being fed and to respect good hygiene in the feed room to avoid accidental contamination. Earlier in 2008, the LCH (part of an international network of authorised analytical laboratories for the detection of prohibited substances) announced that as of May/June it will have the possibility of testing for “harpagosides”, the presumed active entities found within Devil’ claw (Harpagophytum procumbens) which are recognised as having possible anti-inflammatory and analgesic properties. The feed industry was given this information prior to the announced testing date in order to be able to inform its clientele of these new measures. It should be pointed out that nevertheless, the responsibility remains firmly with the person administering any product by mouth to ensure that he/she is certain of what is being given and to be aware of the local and/or international rules concerning “prohibited substances” that govern his/her equine sport according to the level of competition (competition or racing). 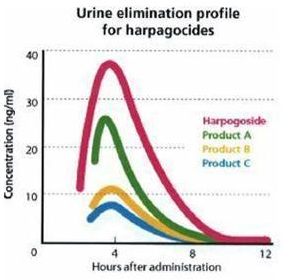 In an article appearing in the French veterinary press (La Semaine Vétérinaire 30 May 2008), data coming from the anti- doping referenced International French horse racing Laboratory was presented that shows the elimination time (as assessed by urinary excretion of harpagoside, the main indicator for Devil’s Claw administration in the horse), after oral administration, to be very short in fact less than 24 hours. In order to provide a good safety margin, Vetoquinol in line with other responsible feed manufacturers, recommends a 48 hour withdrawal time from FEI regulated competition. Due to various different rules in place according to the regulatory body, Vetoquinol recommends that a veterinary surgeon's advice be sought with regards to appropriate withdrawal times to employ. Vetoquinol advocates the respect of local and international rules that govern equine competition and horse racing. EQUISTRO®’s “best practices” recommendations relating to avoiding an inadvertent positive test for a banned substance in competition horses. ● Can it be used safely in a horse which may be competed under rules? ● Is it necessary and is it compatible with other treatments the horse may be having? ● Has it been totally eliminated from the horse's body by the time of the competition? A wide range of banned substances, including anti-inflammatory drugs such as phenylbutazone (bute) and tranquilisers such as ACP (acepromazine), are commonly used with horses but are unacceptable under affiliated or international competition rules (consult the FEI website www.horsesport.org for a detailed list of prohibited substances). ● Use only quality feedstuffs originating from reputable manufacturer’s whose labels are in conformity with European directives and hence indicate precisely the additive and ingredient composition. ● The practice of retaining samples of foodstuffs used for a particular horse and the batch codes that appear on the feed packaging are current. EQUISTRO®, as part of the EQUISTRO®Clean Sport Programme, monitors the plant containing products. ● Great care must be taken when using supplements. Carefully read the label. If you do not know exactly what you are giving, it may contain prohibited additives or preservatives. ● Avoid contamination from another horse's buckets and feed utensils. ● The risk of accidental human contamination should not be underestimated. Horses have tested positive for illegal substances following the offering of chocolate treats by the owner or others in contact with the horse. ● Occasional positive dope test for opioids (morphine-type medication) from poppies, particularly poppy seeds on bread rolls fed to horses. EQUISTRO®’s commitment to the analysis of all batches of EQUISTRO® products containing plants, their extracts or tinctures for peace of mind. Without quality there is no security, without security there is no quality!! Vetoquinol performed a “horse rider survey regarding attitudes and behaviour to supplements” which collected market research from 600 horse riders from the UK, Germany and France in 2009. When asked: Imagine you would be buying nutritional supplements for horses, what reasons would influence your final choice of a particular product? Please rate the importance of each reason in your decision. 50% of you cited the importance of clear label indications on the product’s security status. 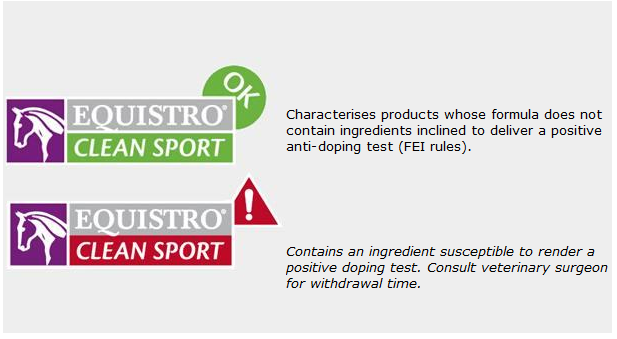 The philosophy behind this EQUISTRO® exclusive program is that of complete label declaration transparency in order to allow the competing sportsperson to make an informed choice regarding whether an orally administered EQUISTRO® product can be given safely while respecting the locally applicable regulations to the competition under consideration. Note: Different countries apply different rules according to composition (notably plants). Consult your veterinary surgeon you information. Every batch of an EQUISTRO® product containing herbs or their extracts are analysed for environmental contaminants by the internationally renowned laboratory for anti- doping control, the LCH (Laboratoire de Cours Hippique). Only when this final report has been received is the product dossier reviewed by Vetoquinol's quality control pharmacist for release. All non-conforming products are refused and destroyed.